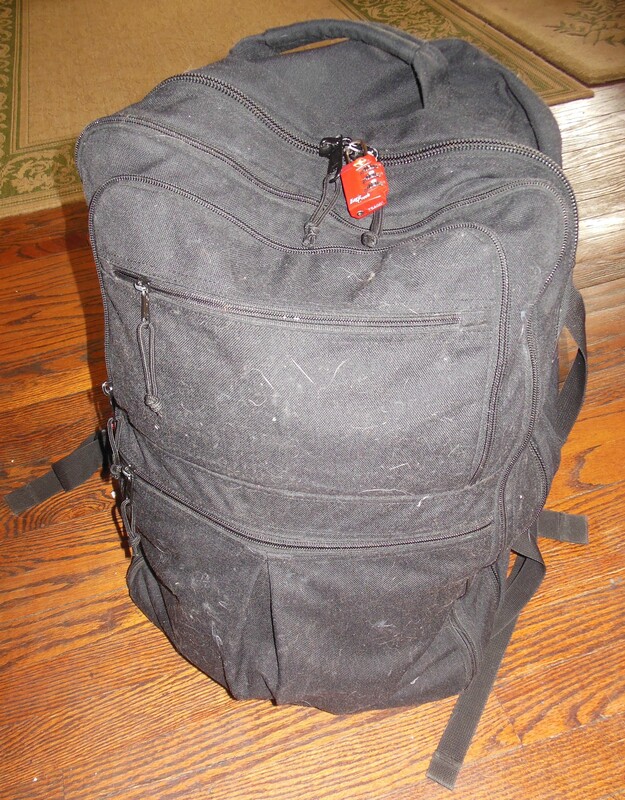 I’m on the way to the airport tonight with an 18 pound backpack. Packing light is a non-negotiable necessity for a budget traveler. If you want to be independent and highly-mobile traveler, pack light. If you want to be tied down by your luggage, be dependent on elevators and porters, and have your airline lose your bags, pack heavy. If you ever have a late train and need to sprint to catch your tight connection, pack light. If you’d rather pay for taxis everywhere, pack heavy. If you want to be low profile, carry just a backpack. If you want to be vulnerable to thieves, bring more stuff than you can keep track of. HOB and I move around a lot on our trips. A typical day will involve a bus or train ride, followed a quick check in to a hotel. We pull our daypack out of our backpacks, and we’re out the door. Our intense itineraries are made possible by the fine art of packing light. Three pair socks. (Always wear your best socks–wool is great for winter). Toiletries. Don’t forget to separate out liquids in a quart bag for TSA. Vitamins, ibuprofen and ginger chews for motion sickness. A small notebook, a dual-language dictionary and a phrase book. Two binders: one of maps, guided tours and other research for each destination and printouts of plane, hotel, and train reservations, and another to put in the daypack for each day’s destination. A cell phone we bought specifically for use while traveling abroad. A picnic kit, described in a previous post. A laundry kit, comprised of a clothes line, one inflatable hanger and instant soap sheets. Food to eat at the airport plus extra snacks. I’ve done this so many times it comes easy, especially since I pack the same stuff every trip, with minor variations for weather. My only agonizing decision is which lipstick to bring. Really, this is a bid deal for me. I confess I can’t narrow it down to just one, so I bringing NYX brand Pure Red and, as an emergency backup NYX Brand Perfect Red. People, I’ve got my 18 pound bag, my two lipsticks, and my puns and I’m ready to board. Want to know where I’m headed? Check back on this blog—as long as I can find WiFi, I’ll keep you posted. 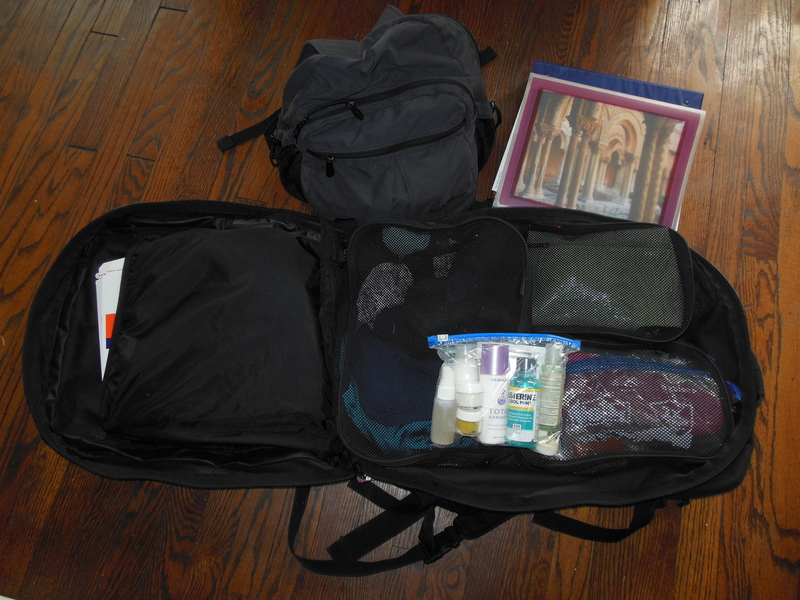 We use packing cubes so we don’t have to unpack–it turns the backpack into a sort of dresser drawer. The smaller bag is a daypack, that I pull out and carry after reaching my destination. Backpack ready for action. (The coating of cat hair is optional, but I find it adds a homey touch).